The Overlords have been incarcerated for many years, but now is your time to rise up and purge the evil contaminating the planets you have nurtured for centuries. Space Overlords allows you to create your own galaxies, and populate them with planets. Customise them to a tee, by selecting planet environment types, land and water proportions, civilisation types, buildings and more. Once you’re done, you can share your creations with the world via a Little Big Planet-style community content hub! Choose from four diverse playable Space Overlords, all with their own unique abilities that affect combat. An additional two playable characters are available in the extended campaigns, which allows you to dig even deeper into the Space Overlords mythology. While Space Overlords delivers creation tools on a huge scale, the game also features devilishly satisfying destruction gameplay. Cities, and even entire civilisations are at your mercy in Space Overlords, with a single footstep having the potential to crush environments. Enjoy this destruction either in single player or in multiplayer with various 4-player modes. 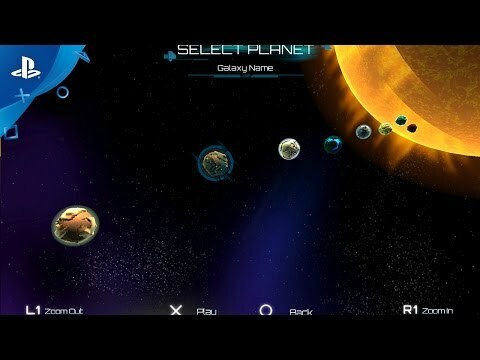 Whether you prefer single player or multiplayer, Space Overlords has it all. Many game modes are playable in local co-op for up to four players. Experience two extended Space Overlords campaigns, with ‘The Fight For the Awakened’ and ‘The Great Serpent’! These campaigns both unlock a brand new galaxy for you to explore.